Southern California Norton Owner's Club on California State Route 41, near Creston. A motorcycle club is a group of individuals whose primary interest and activities involve motorcycles. Most clubs are either organized around a brand or make, or around a type of riding (e.g. touring). Motorcycle clubs vary a great deal in their objectives and organizations. Mainstream motorcycle clubs or associations typically have elected officers and directors, annual dues, and a regular publication. They may also sponsor sports events and annual or more frequent motorcycle rallies where members can socialize. There are a great many brand clubs, i.e. clubs dedicated to a particular marque, including those sponsored by various manufacturers, modeled on the original brand club, the Harley Owners Group. There are also large national independent motorcycle clubs, for example, the BMW Motorcycle Owners of America. There are also specific clubs for women, such as Women's International Motorcycle Association, and clubs for lesbians and gays, such as Dykes on Bikes. Clubs catering for those interested in vintage machines such as the Vintage Motor Cycle Club are also popular as well as those centered on particular venues. Clubs catering for riders' rights such as the Motorcycle Action Group, and charities like The Royal British Legion Riders Branch are also popular. Many affiliate with an umbrella organization, such as the British Motorcyclists Federation in the UK, or FEMA in Europe. Producing national and local branch club magazines and events are typical activities of such clubs. Other organizations whose activities primarily involve motorcycles exist for specific purposes or social causes such as the Patriot Guard Riders, who provide funeral escorts for military veterans, and Rolling Thunder, which advocates for troops missing in action and prisoners of war. 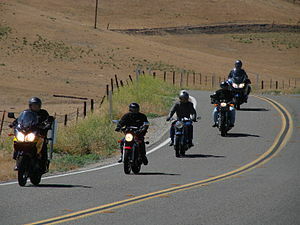 While neither of the latter two groups require a motorcycle for membership, they are motorcycling-oriented and much of their activity involves rides. There are numerous religiously oriented clubs such as the Christian Motorcyclists Association, a biker ministry, charities such as Freewheelers EVS, which use motorcycles to provide an out-of-hours emergency medical courier service, and clubs which attract membership from specific groups, such as the Blue Knights Law Enforcement Motorcycle Club, for law enforcement personnel. One of the first motorcycle clubs was the New York Motorcycle Club, which in 1903 merged with the Alpha Motorcycle Club of Brooklyn to become the Federation of American Motorcyclists. Later, the Motorcycle and Allied Trades Association (M&ATA) formed a Rider Division which spun off into the American Motorcyclist Association. The American Motorcyclist Association (AMA) is the largest American motorcyclist organization. It serves as an umbrella organization for local clubs and sporting events. As of 2015, the AMA counts over 200,000 active members and over 1,200 chartered clubs. The abbreviations MC and MCC are both used to mean "motorcycle club" but have a special social meaning from the point of view of the outlaw or one percenter motorcycling subculture. MC is generally reserved for those clubs that are mutually recognized by other MC or outlaw motorcycle clubs. This is indicated by a motorcyclist wearing an MC patch, or a three-piece patch called colors, on the back of their jacket or riding vest. Outlaw or one percenter can mean merely that the club is not chartered under the auspices of the American Motorcyclist Association, implying a radical rejection of authority and embracing of the "biker" lifestyle as defined and popularized since the 1950s and represented by such media as Easyriders magazine, the work of painter David Mann and others. In many contexts the terms overlap with the usual meaning of "outlaw biker Quotes" because some of these clubs, or some of their members, are recognized by law enforcement agencies as taking part in organized crime. Outside of the outlaw motorcyclist subculture, the words "motorcycle club" carry no pejorative meaning beyond the everyday English definition of the words – a club involving motorcycles, whose members come from every walk of life. Thus, there are clubs that are culturally and stylistically nothing like outlaw or one percenter clubs, and whose activities and goals not similar to them at all, but still use three-part patches or the initials MC in their name or insignia. ^ Feuer, Alan (May 29, 2006). "Revving Their Engines, Remembering a War's Toll". The New York Times. ^ Grant, Japhy (March 28, 2006). "Biking to block Phelps". The Advocate. p. 22. ISSN 0001-8996. ^ Platoni, Kara (July–August 2006). "The hogs of war". Mother Jones. pp. 16–17. ^ "Police Motorcycle Club Invades Tyler". Tyler Morning Telegraph. Tyler, Texas. July 25, 2012. pp. 1A, 6A. ^ "History of Motorcycle Clubs". BikeDomain. 17 February 2015. Retrieved 6 March 2015. ^ "AMA Facts & Figures". American Motorcyclist Association. Retrieved 6 March 2015. ^ Drew, A. J. (2002), The everything motorcycle book: the one book you must have to buy, ride, and maintain your motorcycle, Adams Media Corp, pp. 273, 277, ISBN 9781580625548, Biker slang or babble (marked BB) [...] mc (BB) Motorcycle Club; this abbreviation usually refers to an outlaw motorcycle club. [...] outlaw (BB) Generally speaking, any motorcycling club that is not represented by the AMA. This does not connote criminal intent. Wikimedia Commons has media related to Motorcycle clubs.